Posse comitatus is the legal power of sheriffs and other officials to summon armed citizens to aid in keeping the peace. The posse comitatus can be traced back as least as far as the reign of Alfred the Great in ninth century England. The institution thrives today in the United States; a study of Colorado finds many county sheriffs have active posses. Like the law of the posse comitatus, the law of the office of sheriff has been remarkably stable for over a millennium. 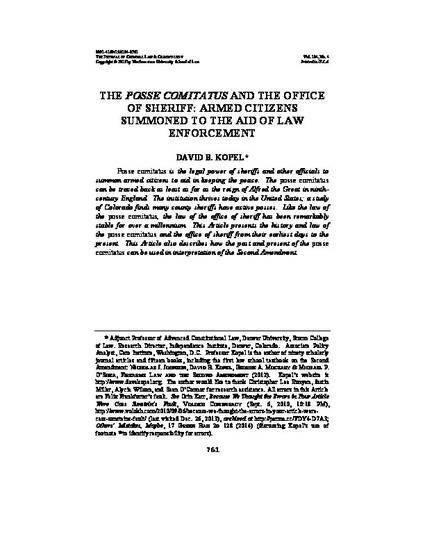 This Article presents the history and law of the posse comitatus and the office of sheriff from their earliest days to the present. This Article also describes how the past and present of the posse comitatus can be used in interpretation of the Second Amendment.